The BCCS schedules a number of Project Weekends throughout the year at the BCCS Homestead. BCCS Members and Friends gather to work on their digging, surveying, exploration, or research projects. The cave trips and digs on Project Weekends are almost always self-organized in advance of the weekend, usually via email. Sometimes there are trips or surface digs that can take extra people at the last minute, but not always. The Project Weekends are good opportunities for interested cavers to get involved. If you would like to join us, please contact a BCCS member about getting on a cave trip. If you do not know any of the members or otherwise would like help getting on a trip, please contact the Project Leader (usually Tony Canike) two or three weeks prior to the Project Weekend. You can find his email address is in the NSS Members Manual. Here is some information on staying at the Butler homestead. Someone needs to volunteer to haul out the trash. We ask that everyone packs out their own recycleables. Consider bringing fine local craft beer in growler to minimize hassle. Here are some of our leads and projects for upcoming Project Weekends. Please print and fill out the waiver if you haven't already. You can check the calendar for Expedition dates. Please see this important note about WNS. We also have a tradition of spending the Saturday before Memorial Day each year working maintenance projects around the homestead. 1. Trips are self-organized in advance, and usually most or all of the cave trips on expedition weekends are intermediate or advanced trips. Most project weekends do not have beginner trips, though frequently we have surface or in-cave digs that are suitable for just about all cavers. 2. Most of the trips have a defined goal that has been planned for weeks or months. Our lead lists are long, our projects many, and our weekends are short. We run trips to survey, dig, mine, dye-trace, rig, derig, lead check, ridge-walk, or other activities to solve the mysteries of the caves in the cove. There usually are not any tourist trips on expedition weekends. 3. 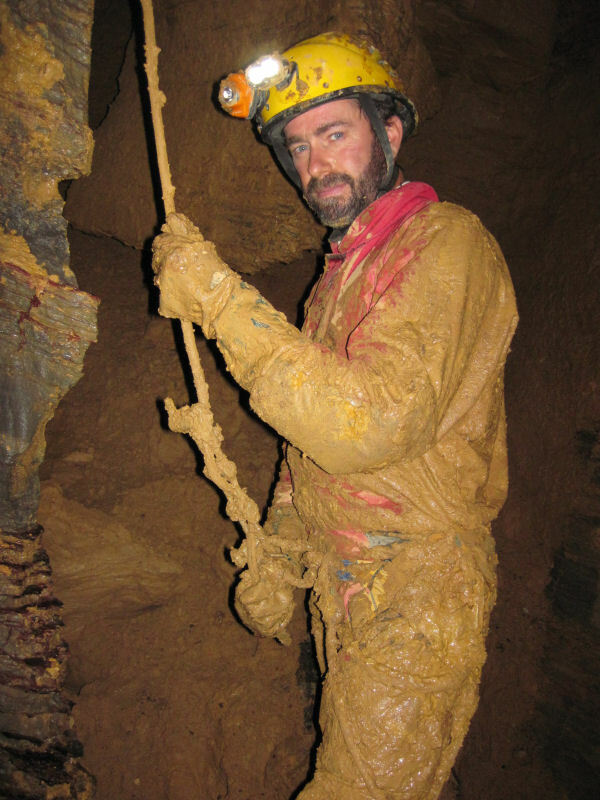 Be prepared for project caving. Bring a large cave pack in case you need to haul bolting gear and ropes. Be geared up and physically fit for 8-14 hour trips. Decon your gear. 4. Bring what you will need for the whole weekend. (Food, water, tent, gas, etc.) The Burnsville area is very rural, with no stores or gas stations nearby. Here is more information about staying at the homestead, our fieldhouse on the Butler Cave property. 5. Historically, the Project Weekends were called "Expeditions" and were organized more like typical expeditions: after everyone had arrived on Friday night, the Expedition Leader assigned people to teams, and then the teams were given exploration assignments in Butler Cave. That worked then, when the Society was focused on exploring and mapping Butler Cave. However today, with many projects and digs, folks self-organize in advance. Mike Ficco in Battered Bar Cave. He's got a harness on somewhere.